Lunar New Year (or Chinese New Year) is one of the world’s great annual celebrations. How big? Massive! In China people are expected to take around three billion journeys as they travel to join family for festivities: think fireworks, lanterns and, of course, food! The shebang begins on Tuesday February 5, with the Year of the Dog giving way to Year of the Pig, and celebrations continuing for three weeks. 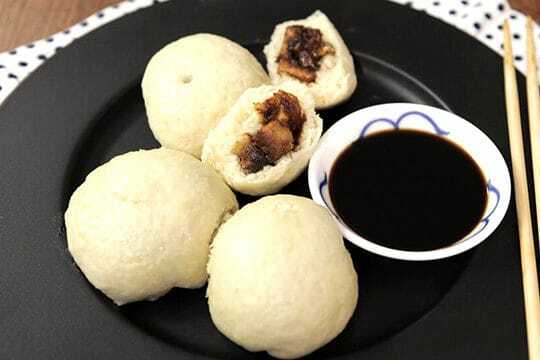 Special ‘lucky’ foods are eaten during this period, sometimes because of their colour (red and pink are lucky colours) and often because their name is a homonym for words such as ‘luck’, ‘prosperity’ and ‘wealth’. I love eating Chinese food at any time of year and I’ve gathered together some of my favourites here. 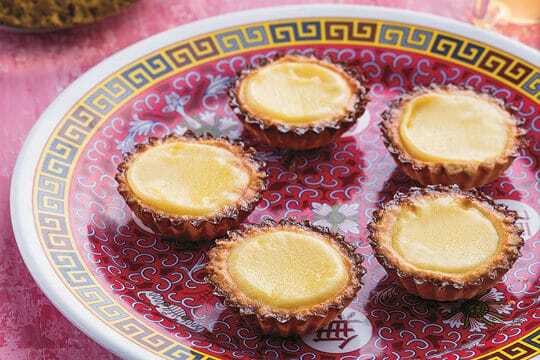 I’m particularly excited to share two recipes from Chinese food guru Tony Tan, Jing Shui Daan, a delicate savoury steamed custard, and Egg Tarts, a sweet treat that’s ubiquitous in Hong Kong. Of course, the celebrations extend to other parts of Asia, so I’ve include dishes inspired by other countries too. 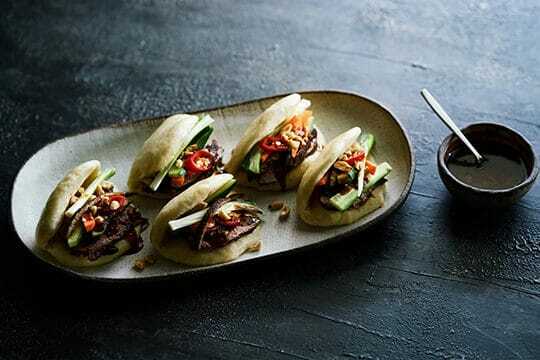 These bao are somewhat Korean and altogether delicious: if you’ve been a little nervous to cook duck, this is just the dish to start with, and you’ll love the trick for getting super crisp skin. Add home-made Kimchi for extra pizzazz. Let’s get one thing out of the way! 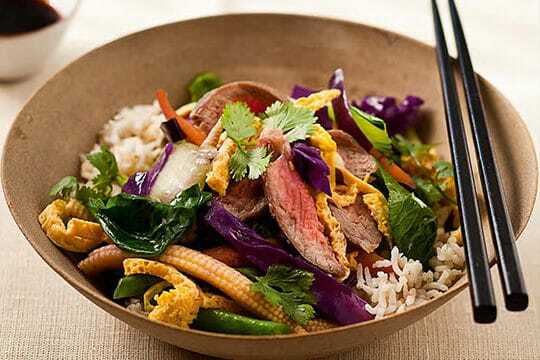 Yes, you can stir-fry in a Thermomix. It’s not the same as stir-frying in a wok but it has its own delightful pleasures, not least the fact that there’s no hissing and splatter with your crunch. This all-in-one dinner is tasty, adaptable, feeds a crowd and is one of my all-time most popular recipes. 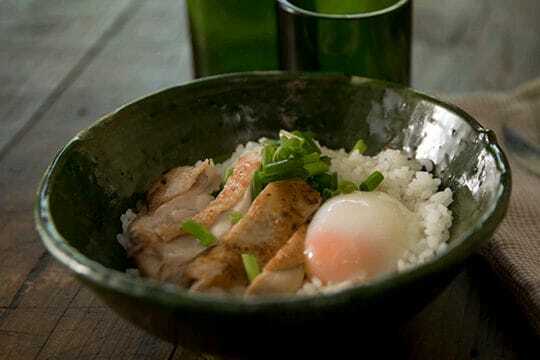 Trissa Lopez (trissalicious.com) investigates that old conundrum of the chicken and the egg in this beautiful dish. Who cares which came first when it’s all so good? The chicken is brined, then poached and grilled until it’s succulent, caramelised and meltingly delicious and the egg is a wobbly, glistening orb. Dumplings are a lucky dish for New Year but I reckon any time you have char siu bao is a lucky day. These fluffy buns encase rich, sticky roast pork. They’re always first to be plucked from the trolleys at yum cha restaurants but why not avoid the anguish and make your own! I’m a massive fan of Melbourne Thai chef Pla Liamthong and her passion for demystifying and simplifying Thai food. 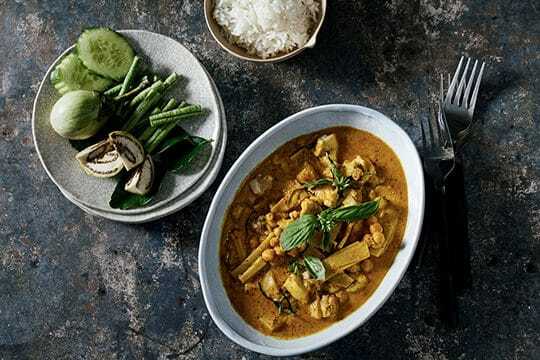 For this dish, we start with a classic southern Thai curry paste which can be used in stir-fries, jungle curries and in coconut curries like this. Thank you a million times, Pla Liamthong, for bringing this Thai curry sauce into my life. It’s such a winner: easy, full of flavour and incredibly versatile. 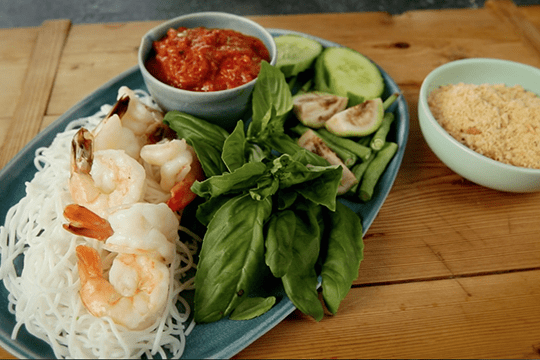 A new spin on Pad Thai, this is a ‘training wheels’ curry for Thai kids, building their tolerance to chilli without blasting their taste buds. Attica’s Ben Shewry, one of Australia’s most feted chefs, cooks up his version of a Chinese takeaway classic. 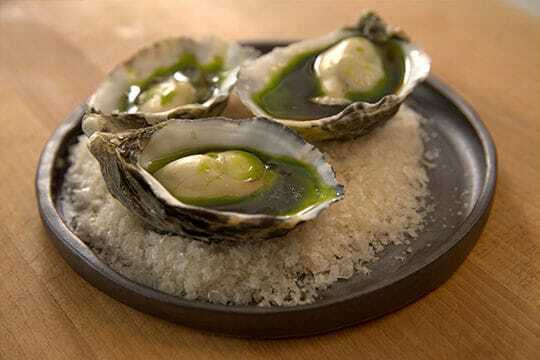 As you’d expect from the boundary-pushing chef, it’s a bit out there but entirely tasty. Ben says the Thermomix is crucial for this dish – but it’s used for just one crucial second. 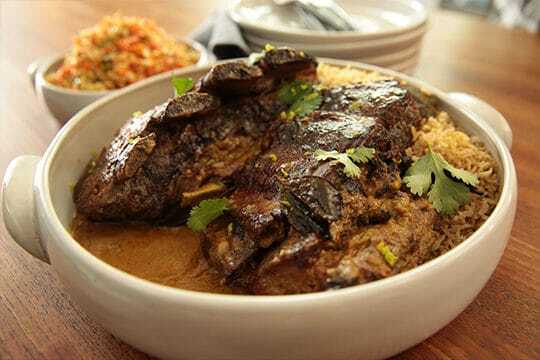 Ribs are one of my favourite meals and this is an easy, flavoursome way to cook and eat them. 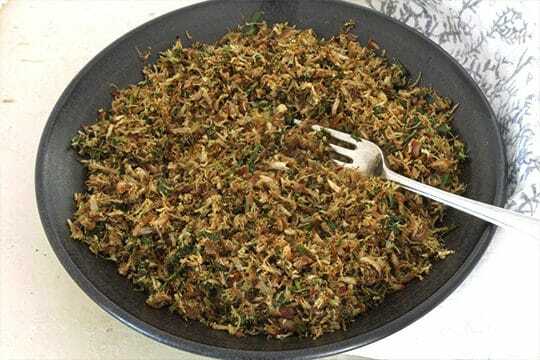 This is a set-and-forget meal that’s spicy, rich and fragrant with rice that borrows the flavours of the marinade and a frisky little salad to keep it lively. Everyone who tastes it loves it! 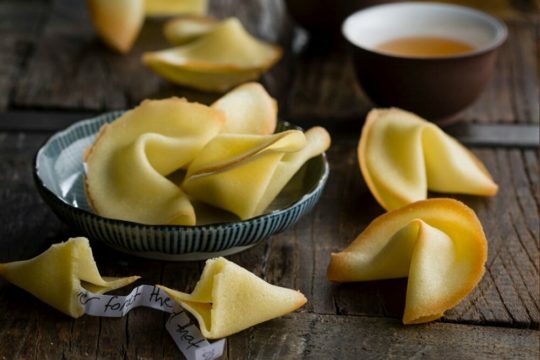 The Fortune Cookies feature in the Chinese chapter of my cookbook Entertaining with Dani Valent! What could be more fun than writing your own fortunes? Well, how about encasing them in your own crispy tuile biscuits? 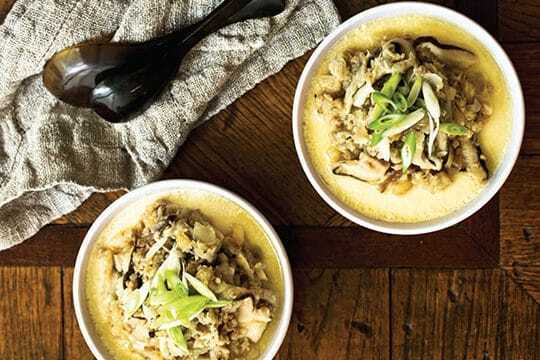 Tony Tan’s savoury steamed custard is topped with pork mince; it’s the most comforting supper dish and so quick and easy to make. 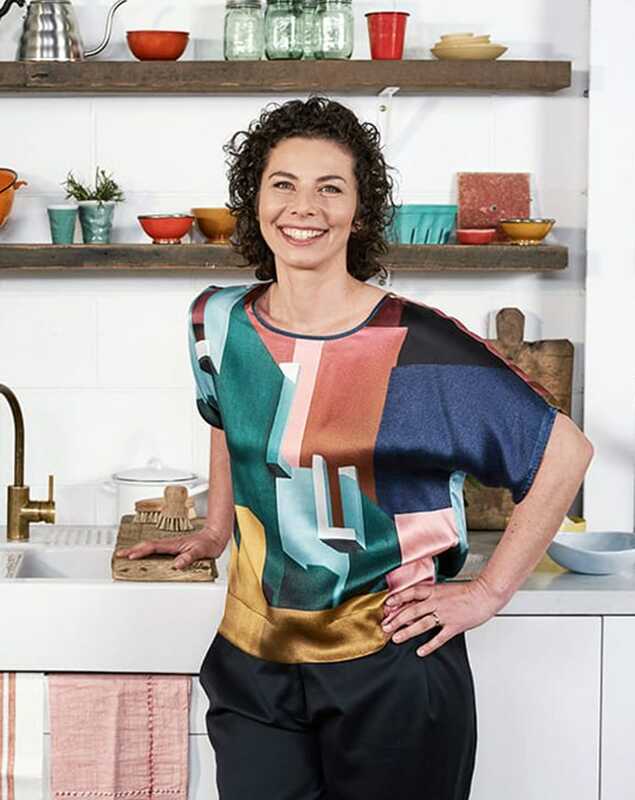 This recipe features in my cookbook, In the Mix 2: More Great Thermomix Recipes. Chef and cookery teacher Tony Tan has also written a great cookbook Hong Kong Food City which is where this recipe comes from. They’re a Hong Kong classic, made here with shortcrust pastry and baked custard.